There are many things to be thankful for this time of year—especially this year! Not the least of these is the ninth World Series Championship scored by our beloved Carmine Hose. But, today, there is yet another thing to be extremely thankful for. The great Luis Tiant turns 78 years old today. Tiant spent eight seasons with the Red Sox compiling a 122-81 record and a 3.36 ERA. In his career overall, he was 229-172 with a 3.30 ERA and 2,416 strikeouts. As has been said many times, it's an absolute travesty that this man is not in the baseball Hall of Fame at Cooperstown. For the incredible 1978 Red Sox team, Tiant won 13 games—and also hurled 25 gutsy innings in the classic 1975 World Series against the deadly Big Red Machine (wining two games and striking out twelve Red Legs). One of the great moments of your Editor-In-Chief's life was a special interaction with El Tiante. 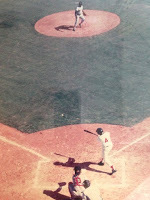 I got a very cheap groundout RBI off him at Red Sox Fantasy Camp in Winter Haven, Florida—way back in 1992 (see weathered photo). It is—and forever shall be—my enduring legacy. Happy Birthday, Luis!